Local, sustainable and artisan are buzzwords often applied to my Brooklyn neigborhood. But I found these also applied to Detroit, when I visited for the North American Auto Show. Local, as in American made, is apparent in a city built by money from American car manufacturers. Yes, many of the gorgeous houses within the city are ruined, but there are still stunning architectural gems that remind you of this city’s gloried past. The ornate Fox Theater and Fillmore East present concerts and traveling productions of Broadway shows, and are worth a visit just to see the facades. Nearby, the Detroit Institute of Arts (DIA) is also in a showcase building, with a huge collection of well known artists. 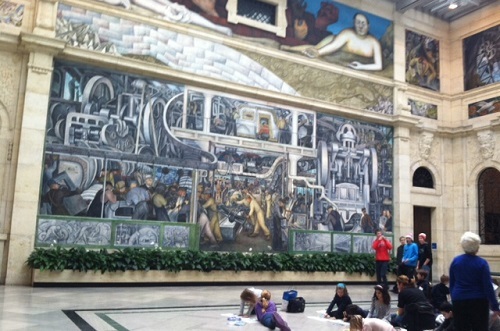 A highlight is the gallery devoted to Diego Rivera Detroit Industry fresco murals. The user-friendly museum has informative text accompanying much of the art, and free guides to help you engage kids, from exploring the armor collection, to playing “I Spy” to finding creepy art. On Sundays, there is free family programming with admission. While I was in Detroit, the DIA got a reprieve in the bankruptcy that was threatening its collection. Though the museum seems safe, visiting while you can still is vital. To make a day of museums, you can visit both the interactive Michigan Science Center and the free Detroit Historical Museum, both within walking distance. Stop for lunch at Maccabees, across the street from the DIA. The restaurant has an extensive variety of salads and sandwiches, and a hipster wait staff. The bar has an enticing selection of craft cocktails and draft beers, so I want to return later in the day! At the Henry Ford Museum, you can see antique and vintage cars, airplanes, trains and dollhouses – this is definitely not a museum just for boys. There are also antique sewing machines and an assembly line printing press. Interestingly, Henry Ford’s wife, Clara, drove an electric car, which did not require hand cranking or shifting. 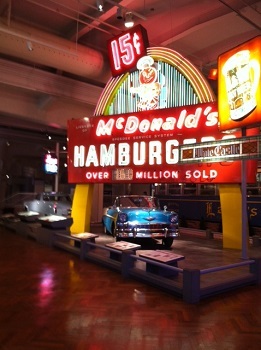 The museum has a Michigan cafe featuring local produce and Larry’s, a rail car diner (inside the museum) where you can have an authentic diner meal – though at current prices. There is also an original McDonald’s facade, but you can’t eat there. The Henry Ford Museum is just part of a huge complex that includes an IMAX theater, factory tour, Greenfield Village, and the Automotive Hall of Fame. In warmer weather, you can explore the living history museum, Greenfield Village which has seven historic districts. You can explore a working 1880s farm, ride in a Model T, and see artisans like glassblowers and potters. Greenfield Village is closed in winter, so I went to the Automotive Hall of Fame. This is definitely a male-centric place; the first woman inducted was Alice Ramsey, the first woman to drive across the Untied States. You can learn about early automotive pioneers – the rest are all male – and see antique cars. To see current Detroit pioneers, check out Shinola, which makes gorgeous watches, bicycles and small leather goods. The bustling showroom is a testament to Detroit’s staying power. Across the street is the Motor City Brewing Works, with hand crafted beer, and gift shops and restaurants are sprouting nearby. I spent two nights at the Westin Detroit Metro Airport Hotel. 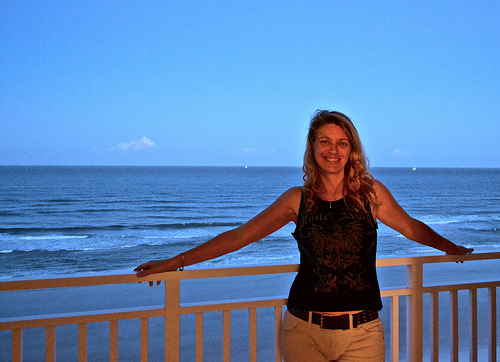 This may be the nicest airport hotel ever, and has a few wonderful perks. The first is that you literally stroll from your gate to the hotel – no need to even put your coat on. And flying out is even better. The Westin has a ‘secret’ security line that took about four seconds to go through. You can even use the Westin security line if you didn’t stay at the Westin – but you have to look like you know what you’re doing. The hotel has a huge gym, rents running shoes and workout outfits for those who forgot theirs, and offers a $5 credit to be used on food if you decline housecleaning. If you are traveling with kids, there is an indoor pool. 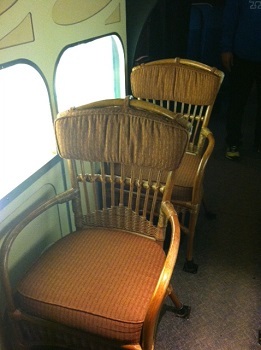 Staying at the hotel reminded me of the golden age of air travel, back when flying was a big deal. My father took us in the 1960s to the airport just to see planes taking off and landing. So if you have little kids who love planes, this could be the place for you. But don’t worry; there isn’t a bit of noise from all the air travel. And the Heavenly Beds truly live up to their name. I also stayed at the historic Dearborn Inn, on the grounds of the Ford Motor Company. You can walk to the Henry Ford Museum complex. There is an outdoor pool and a fitness center. Note: I was a guest of Ford and Visit Detroit. Opinions expressed are my own.